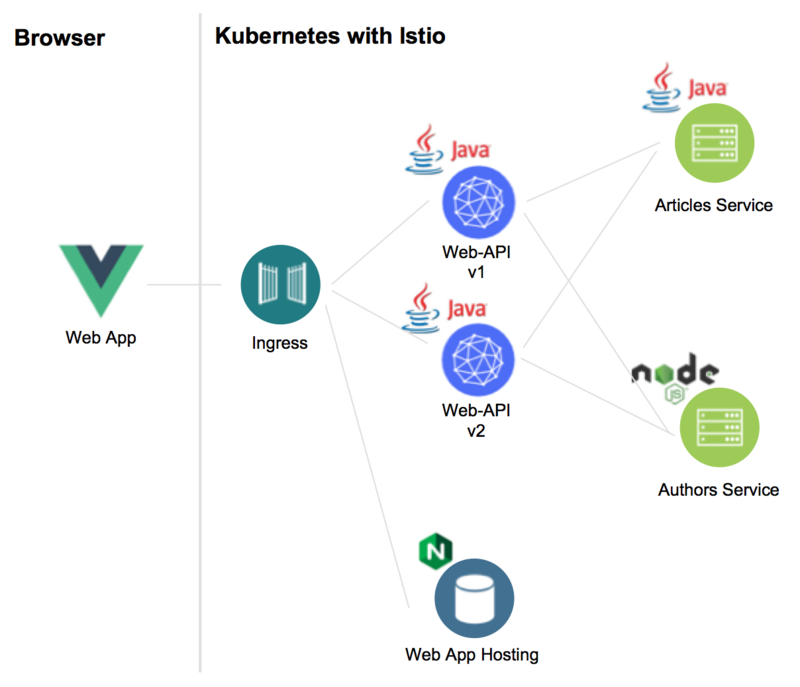 Istio is an open source service mesh to connect and control microservices in cloud native applications running on Kubernetes. One of the key features is traffic management for A/B testing, canary rollouts and blue-green deployments. My colleague Harald Uebele and I have implemented a sample which is very easy to set up that demonstrates this capability. The Istio Bookinfo shows similar functionality, but there is one significant difference: The Bookinfo application routes traffic to services that are not accessed from Istio Ingress. Our sample demonstrates how to route traffic from Istio Ingress to different versions of the “Web API” service (which implements the backend for frontend pattern). The API is invoked from a web application. Harald describes in his blog in detail how exactly Ingress needs to be configured. In summary a Gateway and a VirtualService need to be defined. In the VirtualService the traffic is split 80% / 20% between version 1 and 2. After this only version 1 of the Web API service is used, which means that always five articles are displayed in the web application. Open the web application on port 31380, for example http://192.168.99.100:31380 (replace the IP address with “minikube ip”). Get the code from GitHub to try out the sample.